This is my version of Santa Maria (SoCal) tri-tip. The real deal requires cooking over red oak, which is hard to come by here in Idaho. I settle for a mix of standard briquets and mesquite lump charcoal. 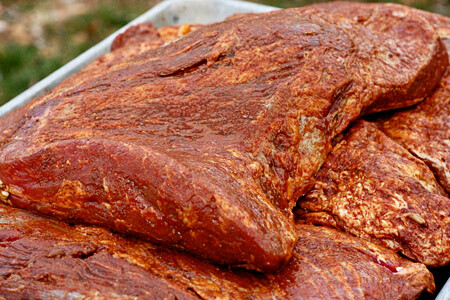 It gives just enough smoke and the mesquite burns very hot, which helps keep the cooking temperature up. 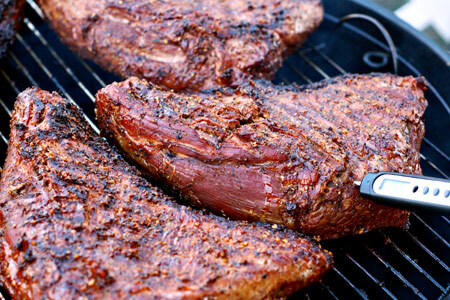 Tri-tip is a triangular cut that comes from the bottom of the sirloin primal. Since it's sirloin, it lends itself very well to grilling. It's a little leaner than a sirloin steak, but its size makes it somewhat forgiving to cook. 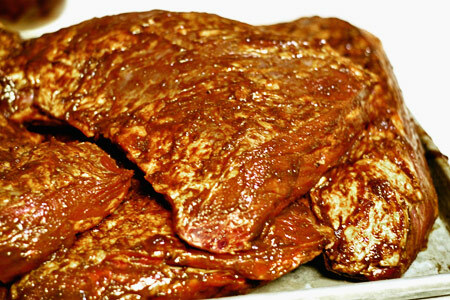 It has a great beefy flavor and is tender if you cook it no further than medium (145º). It's sometimes hard to find in the eastern part of the country, but try it if you can find one. Enough already, let's get on with it! Note: I cooked several roasts for a large party. The measurements listed below are for one roast. First, I mixed the schmear. Peel and trim the roast. I say "peel" because it may have a layer of loose fat on one side. Peel that away with a sharp knife then trim off any large chunks of fat. You want to leave some fat on the outside if you can. All too often supermarket roasts are over-trimmed. If that's the case, just press on. very dirty. Make sure you get it completely covered as evenly as possible. Put it in a zip-top bag and put it in the fridge to get happy for at least six hours, or preferably overnight. Take it out of the bag and let it set out for about an hour before you are ready to cook. Start a good sized fire with a 50/50 mix of mesquite lump charcoal and whatever briquets you use and prepare for indirect cooking. You are shooting for a cooking temp of 350*. 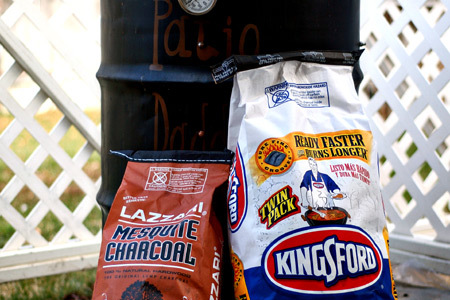 If you're using a gas grill, make a smoker pouch with some mesquite chips. 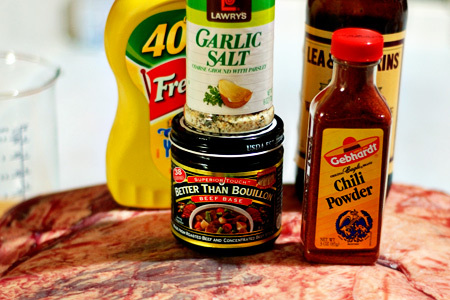 coating of Montreal Steak seasoning. Press it in to make sure it sticks. Once your grill or cooker is hot, commence cookage! You want to cook it indirect, starting with the fattier side down. When the internal temperature in center of the thickest part of the roast reaches 120º (about 30-45 minutes at 350-375º) flip it over. Continue cooking until the internal temperature reaches 130º (about 20-30 more minutes). Move the roast to a platter, tent it with foil and let it rest 15-20 minutes. Cut across the grain into 1/4" slices, serve with some nice salsa and some warm flour tortillas. You've got yourself a crowd-pleasin' spread o' cow. 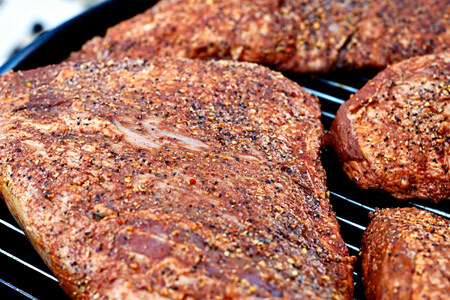 I am making Tri Tip on Friday. I am going to try your recipe. I am setting here trying not to drool all over myself. Cooked this last night for guests. It was wonderful. 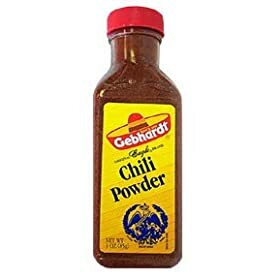 I didn't have beef base, so I skipped that, and I just mixed in the Montreal Steak Seasoning in with the rest of the marinade. Also subbed Dijon mustard for plain mustard. Only had three hours to marinade. Cooked on the Big Green Egg at 300, direct with Royal Oak Charcoal and a small piece of Pecan wood. Took 30-40 minutes to get to 135. Pulled, then tented with foil for 10 minutes. A perfect medium. Thanks for the recipe! Sometimes my tri-tips turn out a little grey, the Chili powder gives it a nice color. Fantastic recipe. Made this for some friends this evening that we have over for dinner. It was gone in a hurry. Good call on stopping at medium, best flavored tri-tip I have ever made. Wow, Billy! That's some high praise, and I'm flattered. Thanks for trying it and for your kind words. I'm really glad that you and your guests enjoyed it. WOW! 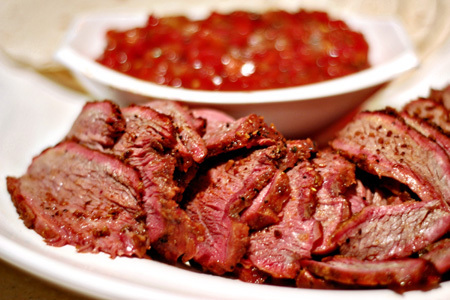 !This recipe knocked out tri-tip out of the park. I made the schmear letting it rest over night. Tonight, I baked my tri-tip due to weather. I can not tell you how impressed I am with this recipe. I also can not wait to bbq it when the weather gets nicer. Thanks so much! I'm really glad that you enjoyed it. Complete home run! 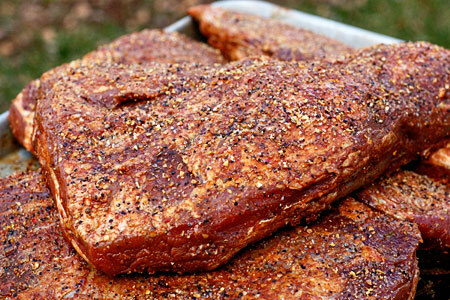 The schmear amped up the beefy flavor of the tritip, and for anyone that's ever used the Montreal seasoning, it was a nice savory addition.The color was fantastic, cooked on my Pit Barrel Cooker with Royal Oak lump, it was juicy, tender, and great smoke ring and smoked flavor. Home Run! Give this a try! This is a fantastic recipe, all our guests love it and fight over the leftovers to take home. We did 6 Tri Tips for a group gathering on our ceramic grill and it turned out amazing. We get requests for this dish everytime folks come over. Anonymous - That is high praise, indeed. Thank you for the kind feedback. My boyfriend worked out in Cali for three years and ate tri tip once a week almost the entire time... we found some tri tip here in Iowa finally (not the easiest to find) and I found this recipe. I wish we had done two tri tips the first time I made the schmear and cooked it on our Green Mountain pellet smoker/ grill. He wants this schmear on absolutely everything now! Randi - The schmear is the key, and I'm very glad that it worked well for you. 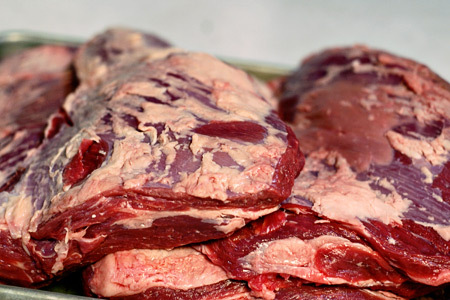 Here's a tip: If you have a hard time finding tri-tip, just ask your butcher to order some. It's cut number 185C in the NAMP book, which is the bible of beef cuts. The term "tri-tip" can mean many different cuts to different people, so specifying the cut number avoids any confusion and ensures that you will get what you're after. Hey Ross! 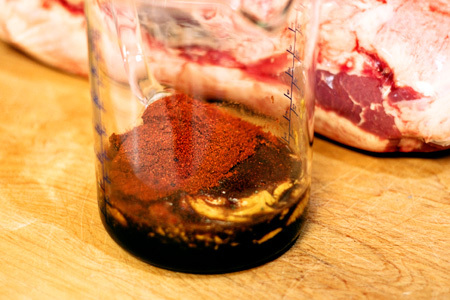 Yes, you can definitely marinate them two days; the longer the better. Please do swing back by and tell me what you think. I don't say this often when people BBQ our local cut (Tri-Tip) and call it Santa Maria Tri-Tip but this looks pretty good. I understand your handicap about not having red oak easy available over there. I like Lump coals was as a last resort. Personally I'd stay away from charcoal products but thats my opinion. When I travel to see other family members out of Santa Maria. I find not everyone in cali BBQ the way we do here. I found you can get a good flavor with wood chips. I'd recommend trying to find oak chips but styles are different everywhere I go. To be honest everyone in Santa Maria will say their BBQ is the best and because you can bbq doesn't mean you can bbq if you know what I mean. Well, best to you and thanks for the interest in one of our favorite meats. The prices have went up recently around here. A lot of us have moved back to the roots of Santa Maria by cooking Top Block since there isn't much price difference. These guys @BBQInTheStix in Santa Maria do a good job. I think they have a facebook too. 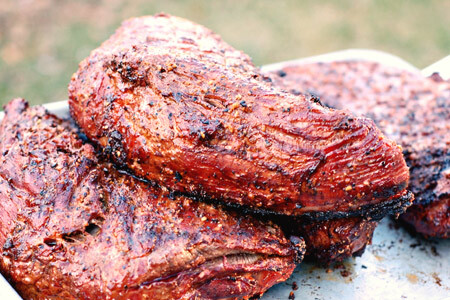 I live in Los Angeles and I came across your tri tip recipe on the web. I had to try it so this past Saturday I followed your instructions to the letter and it came out amazing!